Update Oct 2018 -- I finally noticed that the email link on this page was to an old address that has been disabled and I wasn't receiving them! That has been fixed now and I will be getting them, sorry about that mixup. As I said on the Hot News page, I am cleaning house of some items I've picked up over the years of doing this page. These items weren't personal to me from my tour so I'm getting rid of them to help me cover some expenses. My policy on everything will be first come, first served, using the timestamp on the email. That's because I might not see an email for a day or more and that will let me check emails in the order they come in. If you "inquire" about something, it's still fair game. If you say you "want" it, I will hold it for you up to a week and mark it gone. Also, to keep it simple, all prices will include shipping in the U.S. Anything outside the U.S. you'll have to contact me and we'll work that out. If you have any doubt or questions about anything, and I'll get back to you as soon as I can. I've always taken personal checks from my Kagnew friends so I don't see any reason that can't continue. I also have a PayPal account that we could possibly use, but we would have to work that out in advance. I was forced to convert to a business account a couple of years ago for some reason and they are now charging me a service charge for every transaction. If you would like to use PayPal, I will have to adjust the price up just a bit to cover the service charge. (Currently that is 2.9% of the amount plus 30 cents) Again, that would have to be worked out ahead of time. Just and we'll see if that works for you. 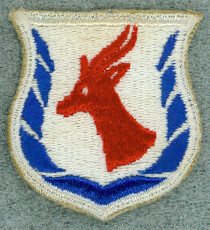 Click on images with a blue border to see a larger image. In advance, thanks for helping out. I still have a few regular Kagnew patches left. I always try to have a few of these for my good page sponsors but I have some extras right now. 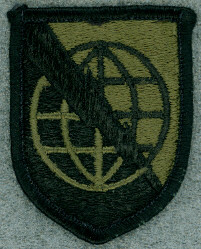 This is a "one only" STRATCOM Signal Corps patch. I came across this a few years ago and have not seen another since.